Yet it all went so… so… painfully wrong. And the Pitch Finals went wrong in such a manner that would be considered impossible. And because everyone likes to watch the hero suffer, I will share with you the ways I brought the impossible into the world. If I’d had a vision board, it would have been full of images of me selling a screenplay and moving my family to the Los Angeles area, and away from our home in coastal, rural Maine – where, outside of the vast and beautiful setting, the most exciting thing that happens here is a really good puppet show. On a whim, I sent an early draft of my very first screenplay to the AFF screenwriting contest, which is widely considered second in significance only to the Academy Awards’s Nicholl Fellowship. My feature-length script, The Cult of Us, was inspired by the fact that people in cults do believe that cults exist; they’re just unable to believe they’re in one. It’s about Ren and Leena, friends and roommates, who fall in love as they attempt to save each other from their respective cult. Can you please remember the character name, Leena? We’re going to need that name later. Leena. Great, thanks. 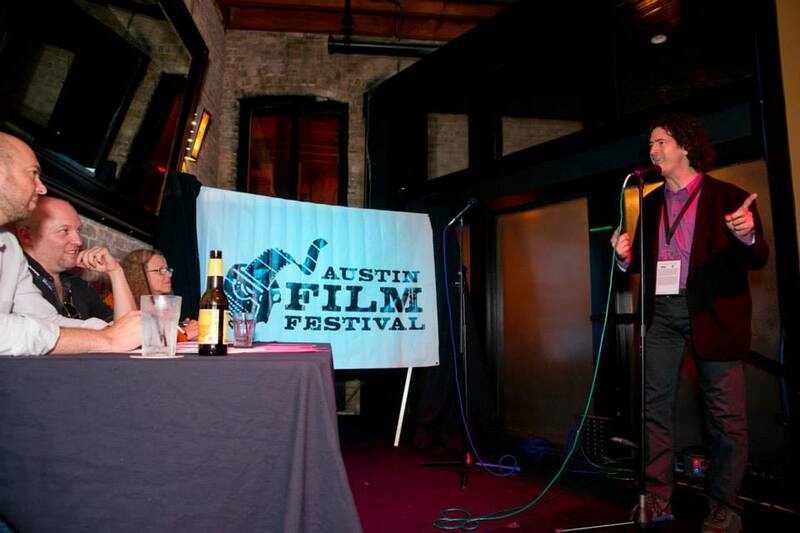 I’d heard of the Austin Film Festival on my favorite podcast, Scriptnotes, where two successful screenwriters, John August and Craig Mazin, discuss the craft in an entertaining way. And when they spoke about AFF, I pictured in my mind’s eye this idyllic, mythological place that one can only visit and confirm its actual existence when one has money to burn – like Hawaii. So, when I got my letter stating my script was an AFF “Second Rounder” (aka quarter-finalist) I was surprised to hear my wife, Jill, ask if I wanted to go. So, after begging family members for money and air miles, and securing a bed at the near-by youth hostel, I was packed and ready to go. The conference is known for its casual atmosphere, where you can sidle up to the bar next to a famous screenwriter, introduce yourself, and have a pleasant conversation. If you don’t act like a douche-bag, everyone is generally open to talking. And though I’ve never been called a douche-bag to my face, Jill says that when I get extra nervous and excited, I tend to transform into a mild version of a 1970’s-Steve-Martin-stand-up-comedian-wild-and-crazy-guy kind of guy. The screenwriters of my favorite two movies were attending AFF that year: Scott Neustadter, co-writer of (500) Days of Summer, and Leslie Dixon, who wrote the screenplay for Limitless (among many other great movies); and I’d finally get to see my heroes from Scriptnotes, John August and Craig Mazin. I flew into Austin, late at night before the first day (repeating my pitch over and over during the 11 hours of flights and layovers from Maine) and checked into the Firehouse Hostel. I had trouble getting to sleep that first night, since I was anxious, it was literally a humid 86-degrees in the room, and my 5 other roommates came and went, slamming the door every few minutes until 2:30 a.m.
At 4 a.m., directly outside the open window by my head and one floor below, a garbage truck beep-beep-beeped into position and emptied a large dumpster entirely full of beer bottles, exploding like a glass bomb. Let’s start keeping track. We’ll call this: Night #1 of Jim Not Experiencing REM Sleep. The first day at AFF was a flurry of checking into the conference at the crazy-fancy Driskill Hotel, euphorically running from inspiring panel to enlightening panel, and sweating through my black suit-jacket the second I would step outside into the 90-degree, late-October, streets of Austin, Texas. Later that day, at a gourmet grilled-cheese party, I was fortunate to meet Via Bia, Heidi Willis, Michael Kandarev, and Carrie Wachob; talented writers who would become fellow members of our unstoppable screenwriter’s group, The Writers Bloc. This had been a great day. That night, I slept for a solid, sweaty, noisy, two hours in a row. This is Night #2 of Jim Not Experiencing REM Sleep. The following day I was starting to feel periodic waves of nausea from the very real exhaustion setting in and my body was beginning to sway. I was glad that I’d decided not to drink alcohol at the conference. However, I was taking regular swigs from the Pepto-Bismol bottle I kept stowed in my jacket’s inside pocket, like a pink hip-flask. I pushed through the discomfort, since I was about to have the opportunity to meet the Scriptnotes guys themselves, and maybe shake their hands after one of their panels. I wanted to thank them for all the great advice, tell them that I had started writing exactly when they started the podcast, and how it seemed serendipitous that their advice came when I needed it most. But that’s not at all what was spoken from my intelligence-hole. When the chance came to shake their hands, I enthusiastically explained about listening to their podcast from the beginning and how, “… your advice came like you were reading my mind! I mean, you were like in my head. Like in my head in a really creepy way!” Craig seemed to minutely wince when I said the word, “creepy.” And even after I noticed that, I inexplicably used the word “creepy” again when I spoke to John! They each seemed relieved to move on to the next fan. Later that day, I found myself in line at a BBQ dinner with writer/producer Leslie Dixon, who was on the top of my people-to-find list. I was shocked when she recognized me from being in the front row of two of her previous sessions. Things were starting to turn around! We started talking and getting along. I was thrilled! I had so many specific questions for her, and wondered if we’d sit down and even eat dinner together. My new best friend was going to be Leslie Dixon! I was struck dumb. Was this a test? Wait, what does fill my soul? My kids? My wife? Do I have a soul anymore from living for twelve years in nowhere-Maine? Would moving to L.A. fill my soul? She politely hmm’d at that. What a lame answer! I was so confused and mortified, I just wondered off in an existential daze, never to speak with her again. But all that’s nothing compared to what’s coming. Snoring, sweating, door slamming, glass exploding: Night #3 of Jim Not Experiencing REM Sleep. This was the big day. I was heading to a session where I would pitch my movie to two professional screenwriter-judges, and if I was one of the top two pitches of that session, I would get to the Pitch Finals later that very evening. I was so tired, I was drooling. As in, from time to time, liquid fell out of my mouth. In that pitch session, I listened to some good and bad movie ideas, a couple people rambled on for 4 minutes (well past the 90 second limit), and one woman bizarrely pitched her resume of contest wins. I was sitting next to a future good friend, Handsome Timmy -Tim Davis. The two of us shared thoughts on the pitches and our state of nervousness. I was terrified and the room was spinning. My name was called. I stood up, smiled at the judges, and when I finished my pitch, I had no idea how it went. The judges’ faces were blank. I asked them if they were sure, since I couldn’t believe that I’d made it to the finals with a perfect movie pitch. But, apparently, according to them, I had. Quick check-in: does everyone remember the name of the character in my pitch which is significant to this story? If you said Leena, you would be correct. A half hour before the Pitch Fest, Nan — the pitch coordinator and the sweetest woman you would ever meet — was having trouble with the sound system. I’m kind of a sound geek, so I stepped in and fixed the technical issue. Nan was immensely appreciative and I won some karma points. We all pulled numbers out of a hat, and I was to be fourth in line, out of twenty pitches. The conference goers packed into the venue, and all my new friends sat around tables on the balcony to watch and cheer me on. At this point, my head felt like it was full of coleslaw. The woman who was to pitch before me, number three, walked on stage. That’s right. The pitch before mine had to do with cults and was titled Leena. What are the odds? Correct, the odds are too great to consider. I was convinced I was hallucinating, and my head reeled as my two functioning brain cells tried to reconcile what I’d just heard. Recently earned karma points: cashed. When the next person came and went, taking my place in line, my friends in the balcony felt terrible, assuming I was in the bathroom puking until I was inside out. When my turn finally came, I feel extra self-conscious about saying the word “cult” and the name “Leena” so many times, but I was getting the laughs from the audience where they were supposed to go and I got a big roar of applause at the end. But, after attending three more AFF’s, people still recognize me and say that mine was one of the best pitches they’d heard. So, that’s kind of nice. And as I rewrote The Cult of Us, I realized Ren and Leena were not overtly falling in love during the course of the script. My pitch reflected this weakness, so the judges were correct! And a couple of drafts later, the script made the Academy Award’s Nicholl Fellowship Quarter-Finals, which is top 5% of submitted scripts. So, that’s kind of nice, too. Since that first year, I’ve spent more energy at AFF making and reconnecting with friends, and not focused on “getting ahead” or “getting signed,” which is an easy trap to fall into with these kinds of events. And do you know what was the best part of my first year at the Austin Film Festival? It was the day I arrived home in Maine, to the quiet, rolling hills, farms, and seaside… when I opened the front door of my house, walked right past my smiling wife and children, into to my bedroom, and fell asleep for 18 hours. Side Note: The Firehouse Hostel has since fixed its air conditioning and the doors no longer slam, so I would suggest staying there for those who need to stay in Austin on the cheap. They also no longer empty dumpsters in the middle of the night, and the hostel is literally across the street from the Driskill Hotel.